In this study, magnetic nanoparticles (Fe3O4/SiO2/APTES) functionalized with murexide were used for the determination of uranium(VI) in sea water by spectrophotometric method in perchloric acid medium using Arsenazo-III as chromogenic reagent. The effects of some analytical parameters, such as pH, contact time, and eluent volume, on the recovery of uranium(VI) were examined in synthetic sea water. The optimum conditions were achieved with a 15 min adsorption time and 2 min elution time with 1 mL of 5 mol L-1 HClO4 at pH of 6.5 and 25 mg of the magnetic sorbent. The linear range, detection limit, and precision (as RSD%) of the method were found to be 0.02-4.0 mg L-1, 0.001 mg L-1 and 3.0 %, respectively. The proposed method is simple, rapid, and cost-effective for the determination of U(VI) in sea water, with a total analysis time of approximately 30 min. The adsorption isotherm was well fitted to the Langmuir model, with a correlation coefficient of 0.9997 and Qmax value was found to be 77.51 mg g-1. 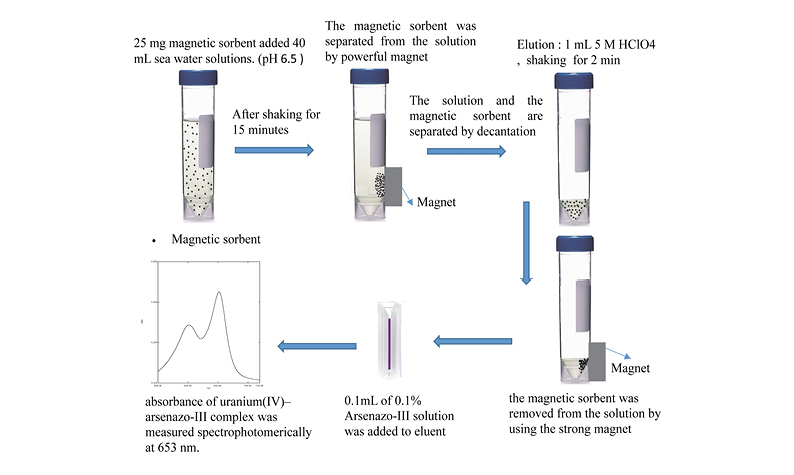 The magnetic sorbent was successfully used for the rapid determination of trace quantities of U(VI) ions in different sea waters, and satisfactory results were obtained.